1996 27′ Proline CC , Twin 2006, 200hp E-tecs, new power head (20hrs. ), 200hrs on the other. Just serviced last year, new fuel lines , water pumps, call back updates done. Garman GPS/fishfinder, VHF radio, porta-potty. Also has salt water wash down, live well and sink with fresh water, and fresh water shower. This boat is great for off-shore fishing, will get you to stellwagon fast and economically. It is great for family cruising, holds 10 people, plenty of room for the kids, high side board. Also has bow dodger to get out of the sun. 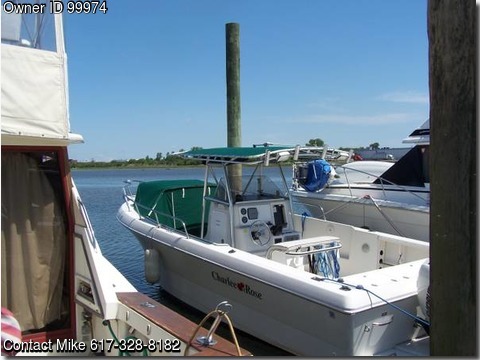 Call Mike for a sea trial, make an offer. Comes with trailer, call for more info,Mike @ 617-957-4653 or 617-328-8182.